In defense of the v9 it is available with different seat configurations and gets 50ish mpg. But it is definitely smaller than any big block tonti. I saw my first California 1400 at Sloans when they started carrying the Indian lineup. Compared to the Indian and Victory I thought the California was a beautiful motorcycle. I was riding a Kawasaki Voyager 1700 at the time and had owned a Nomad 1700 for a few months. I really don't like cruisers with just a windshield. I have never been able to eliminate the buffeting. I like riding sans windshield but in the cruiser riding position anything over 55 is a strain because you are not leaning into the wind. So this thread literally came to life today. Jenn and I pulled up to a big multi-brand dealer on our V7s and we're immediately approached by two riders (1 Goldwing, 1 aluminum-case kitted KLR). The Wing rider asked "where do you get your Guzzis serviced"? My answer "in my garage" didn't help. You see in the greater Philly/NJ area we've lost 3-4 Guzzi dealers in the last year or two... Actually two just THIS YEAR. Turns out this guy HAS a Cali1400 also but might not keep it if he has to go to CT for service. We talked about how easy it is to set valves and how some of the NJ MGNOC guys or myself would be happy to help teach him, but I get the impression that's not what he wants. He mentioned that it is a nice bike but it would be shame if he has to sell it for lack of service options. Bottom line I suspect that most motorcycle owners don't service their own bikes, and those who do leave it largely at fluids and filters... Chains when applicable... And leave their valves alone. Harley's and Indian's greatest selling points in these situations are that they are pretty much change fluids and ride, and there is a Harley dealer or independent shop nearby for everything and everyone else. I think this is an accurate depiction summed up perfectly. This forum and the great guys here is what has kept Guzzis in my basement the last few years. I saw your post and thought about why and how I picked the 1400. Sold it after I returned from a month long trip and have looked to replace it with another 1400 since I realized how much I had grown to like it. This old broken down 62 year old body can still do lots of hours and miles in that seat and not be crippled when I am done. The only change I did was add the comfort gel seat. That engine is a highway mile eater, and it is so nimble for a BIG bike. So as you can tell I love mine!! I do think fear of the unknown is a factor, and limited dealer network. That's a shame Dan. Maybe you can find someone to help bring them out of the basement and back on the road. I think it is a natural feeling to feel a little insecure with any brand of anything one owns when there is little to no factory support for that item. I chose Guzzi because after of 50 years of ridding bikes and most all the modern brands from Triumph to BSA, all the metrics and HD, in the last chapter of my ridding career I wanted to do something different, so MG was my choice. I have no regrets as I love these bikes and and so glad I have this forum. 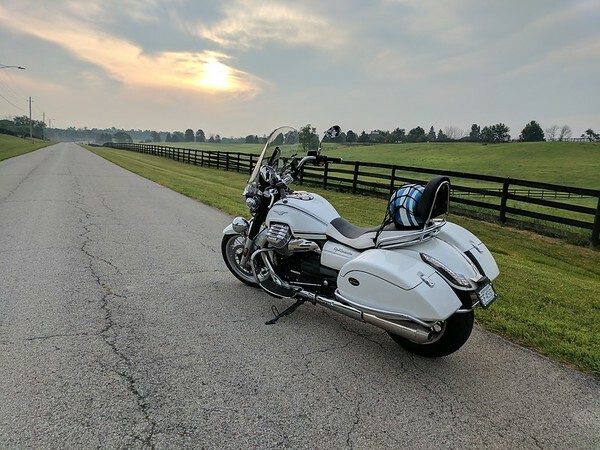 I seriously looked at a Cali or Eldo before buying the Road King. It's just the unknown and a good deal on a FLHP that made up my mind. If Guzzi had an updated Cal Vin with a 1200 motor for $14,000 that mighta swayed my decision. I really liked the Cal Vin. I think the future for Guzzi will be V7, V85 & V9 til Euro 5 or 6 kills them. If they do go liquid cooled I hope it's just liquid heads and keep the fins on the cylinders. For me it was a progression back to my roots of riding. My first bike was an air cooled, shaft drive, Yamaha XS750 triple. Over the years I have grew to dislike the look of radiators on bikes, dislike the noise and maintenance of a chain, and the carbs never being dialed in for the altitude I was riding that day. The V7 brings me back full circle. Now I am looking for a small displacement dual sport / adventure bike for all the gravel and chip and seal farm roads within the 30 mile radius of my home. Chip and seal. Good grief, one can almost hear the rummer being ripped off the tires. I swear 5 days in PA can completely consume a set of tires! I am test riding a Van Van 200 tomorrow. $4200 OTD for a new '18. I like the retro style and the huge seat for my screwed up nerves. Nice bike. I had a TW. If you ever need to 65, forget it. I really wanted to love it, too. Try living in a tiny town that lays the chip, every season, without the seal. So you're basically riding on marbles on half of the residential roads. Oofta.